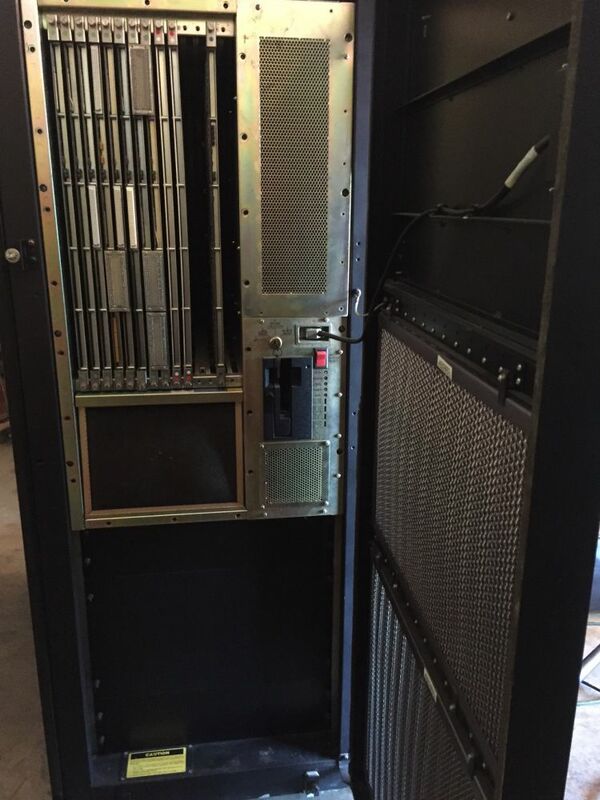 ** Updated on February 7, 2017 ** Hopefully, if all goes well, I will soon be the owner of four 1980's (mini-)supercomputers, which have been donated by a professor at Stanford University. I've had a shipping company collect and crate these, they've been shipped across the Atlantic, and are currently sitting in a warehouse in Rotterdam. They've just cleared customs, I paid the duties and import fees, and am now awaiting word on the delivery date. Meanwhile, any and all pointers to technical documentation about any of these is most welcome! 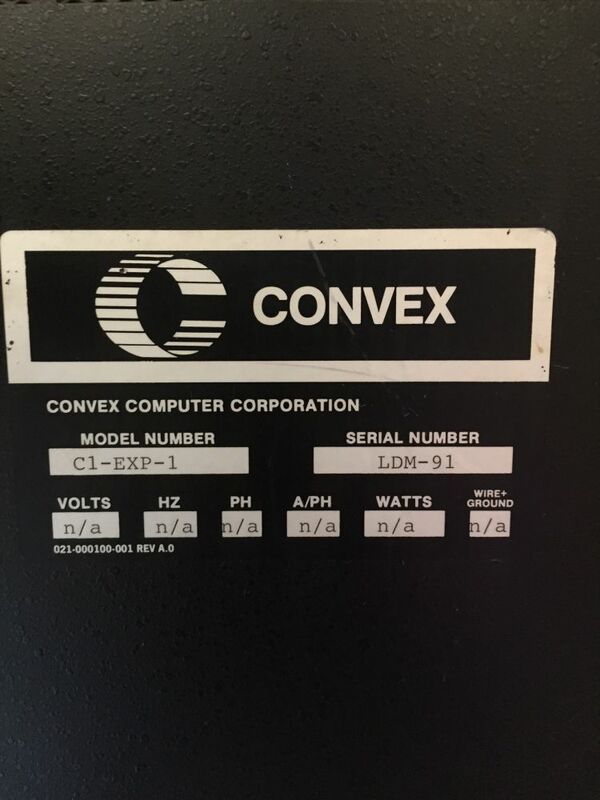 The first two systems are a Convex C1 XP and a Convex C1 XL, both introduced in 1986 as follow-ons to the original C1 (1984). The C1 consists of a high performance 64-bit custom designed CPU with integrated scalar/vector functions built from 8k CMOS gate arrays. It supports 4 GB of virtual memory and up to 1 GB or physical memory. Capable of delivering 40 MFLOPS (peak). Runs an enhanced version of Berkeley UNIX, with VAX/VMS DCL command language compatibility; DECnet; VAX/EDT compatible text editor; VMS compatible job batch system; Fortran language extensions compatible with VAX and Cray Fortran. 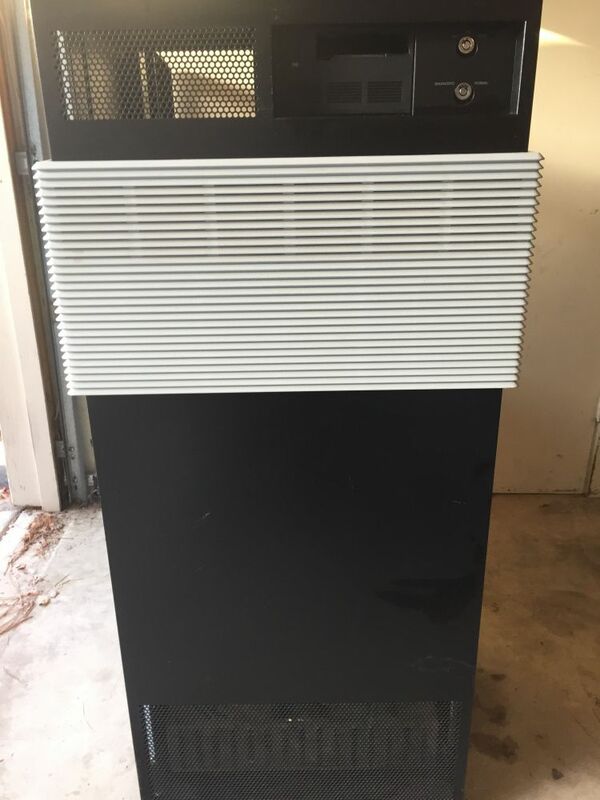 An early Convex system like this has been at the top of my wishlist for a long time, particularly for its special UNIX with VAX/VMS compatibility features, and I never thought the day would come close where I could own one. 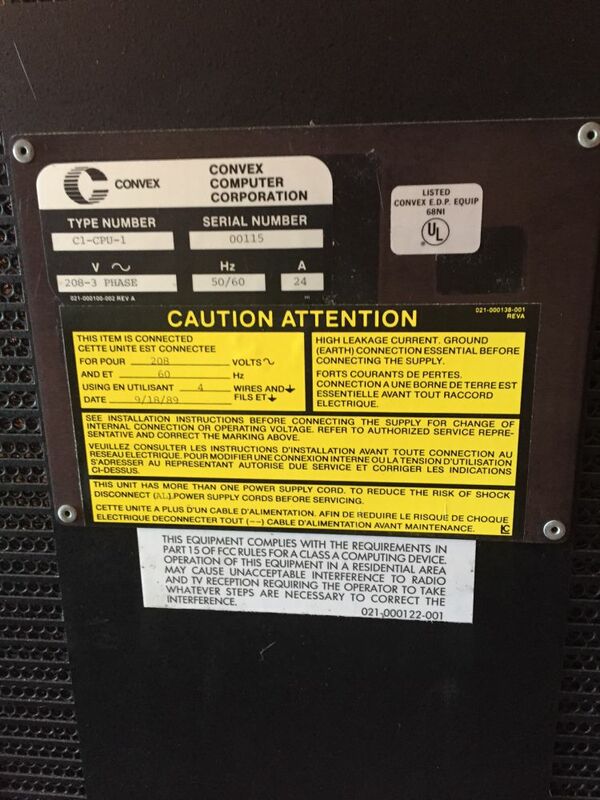 Information on the C1 XP and XL is sketchy, but this article provides some information: https://www.computer.org/csdl/mags/co/1986/12/01663131.pdf; apparently, the XL is an entry-level supercomputer (US$350,000 = US$770,000 today) with up to 64 MB of main memory. The XP was an addition to the top end, available for US$475,000 (US$1,050,000 in today's dollars). That article also reports that the XP would be available in 2- and 4-cpu configurations, but according to Convex alumni I spoke to this never materialized until the C2 was released. According to Tom Jones' "Engineering Design of the Convex C2", the C1-XL was a renaming of the original C1, and the C1-XP was a C1 with the addition of scalar floating-point hardware, implemented in 20Kgate CMOS chips, as well as increased memory capacity (1GB). The C1-XL seems to be more than just a renaming though, at the very least it's a repackaging into a smaller card-cage, with less I/O and memory capacity. I'm getting a lot of help from people on the ex-Convex mailing list, as well as from the person I'm acquiring it from, in identifying what I have. 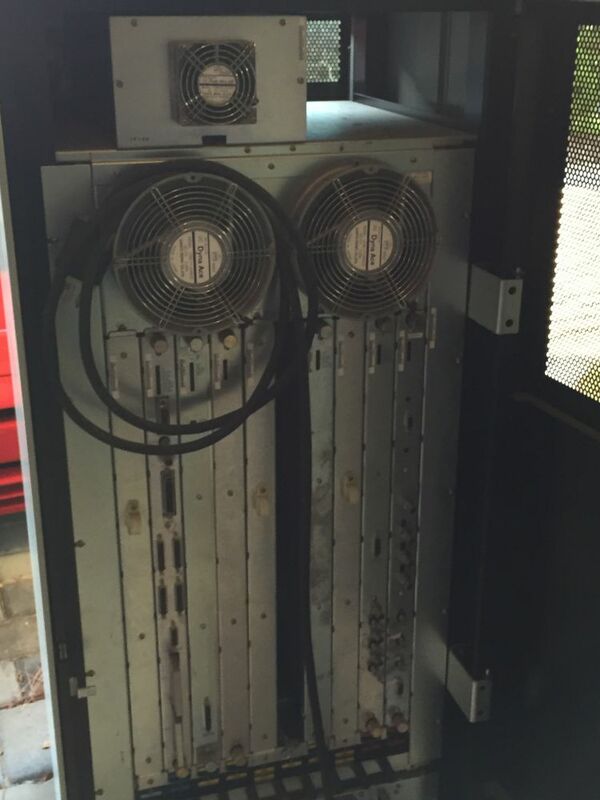 There should have been an I/O cabinet with both the XL and the XP, but the systems I'm getting only come with a single I/O cabinet. 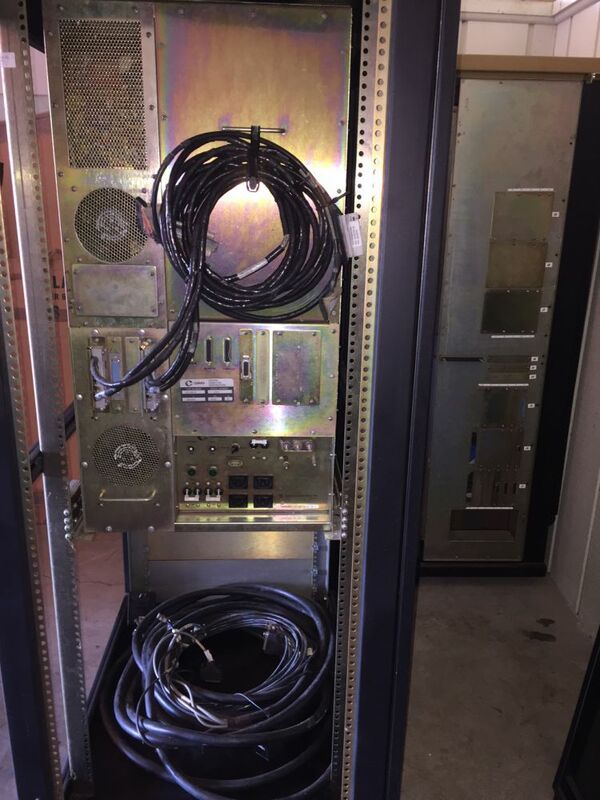 It is likely that this cabinet will work with both the XL and the XP. 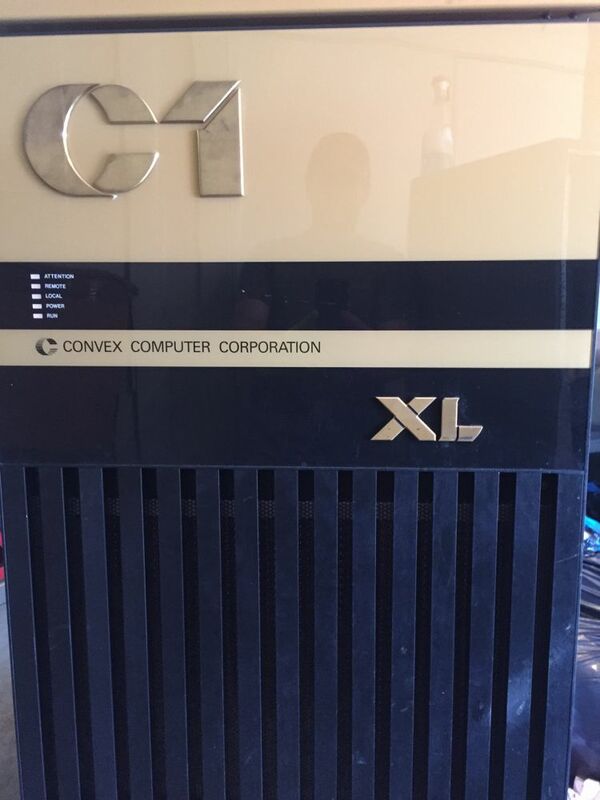 This system started life as a C1 XL with 32 MB of memory, but was upgraded to a C1 XP with 128 MB of memory at some point in time. 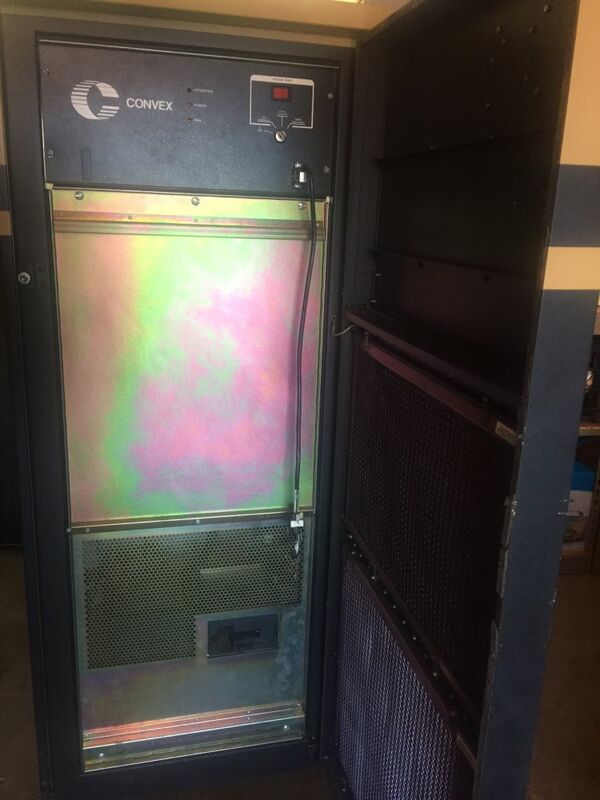 The C1 XL cabinet has apparently been left behind then. 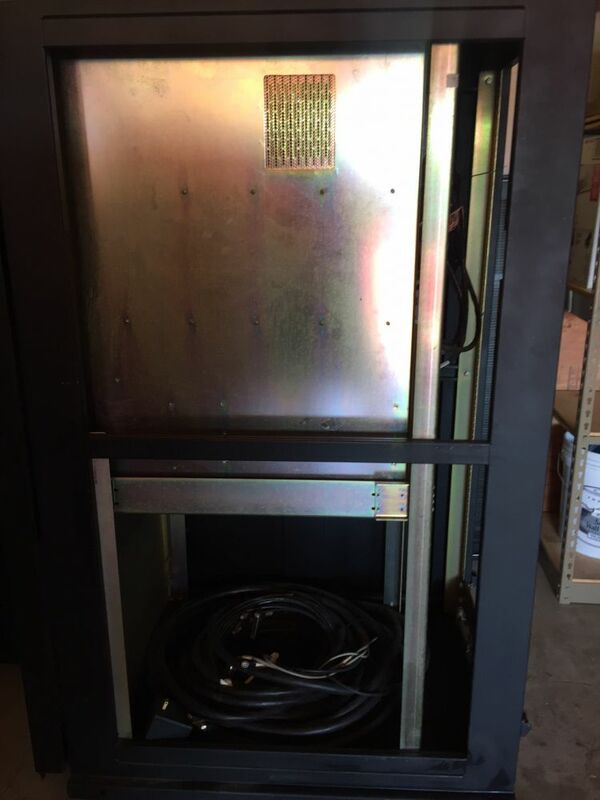 So, in total, there are three cabinets, each measuring 25 x 40 x 62 inches (64 x 102 x 158 cm), and weighing about 500 pounds (250kg). 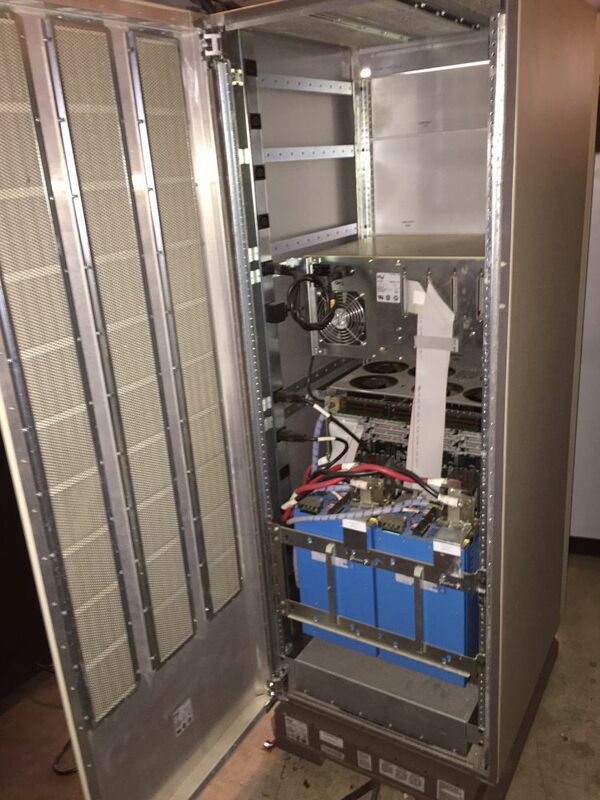 The C1-XP cabinet contains a large card-cage at the top (22 slots, it seems like). 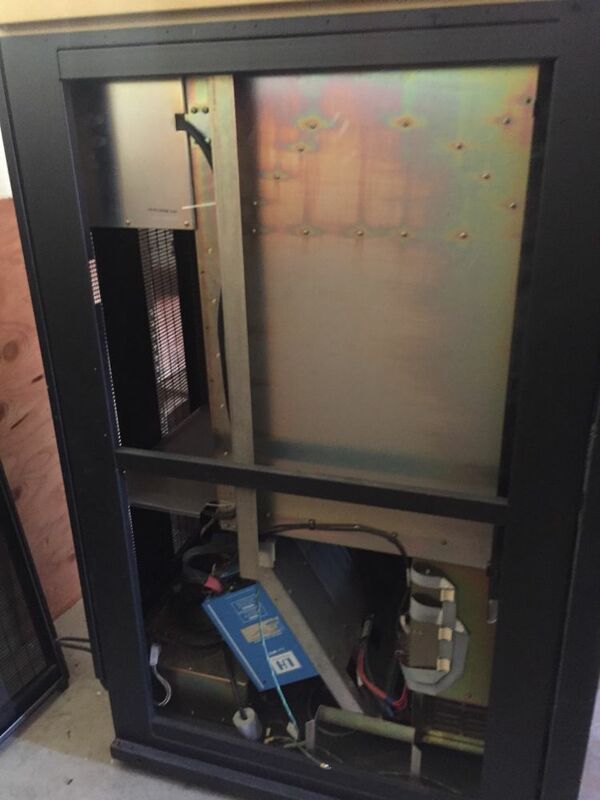 Underneath it, at the back of the machine, are three large power supplies, and at the front of the machine are a small card cage (Multibus or VME), a tape drive and hard disk; these are used to boot the SPU (Service Processor Unit), a 68000-based computer running V7 UNIX that controls the rest of the system. 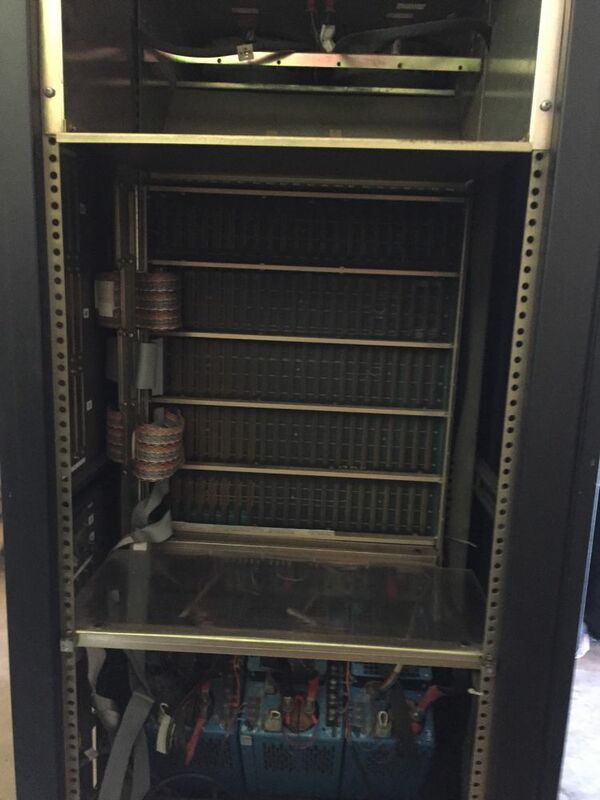 The C1-XL cabinet contains a smaller card-cage at the top left hand corner (14 slots). 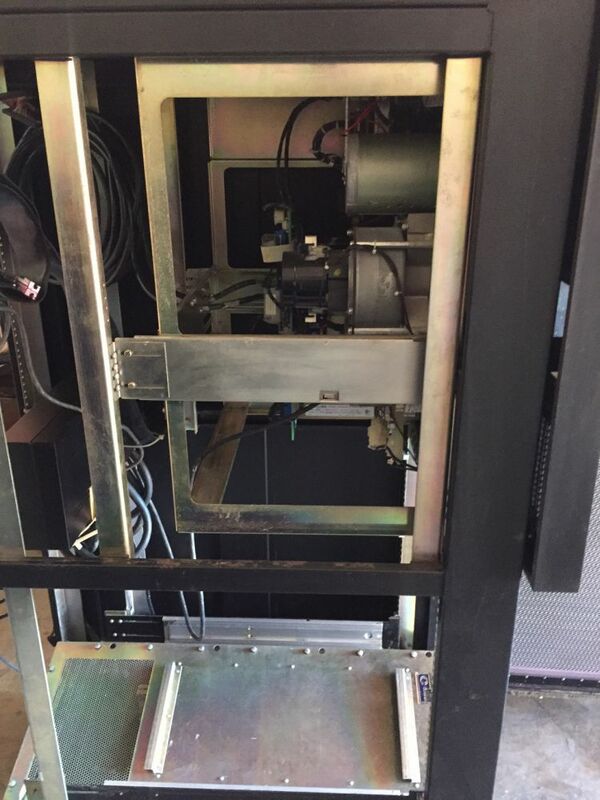 The power supplies are built into the back of this chassis, and the Multibus or VMS card cage and the SPU tape drive and hard disk are built into the right-hand side of the chassis. 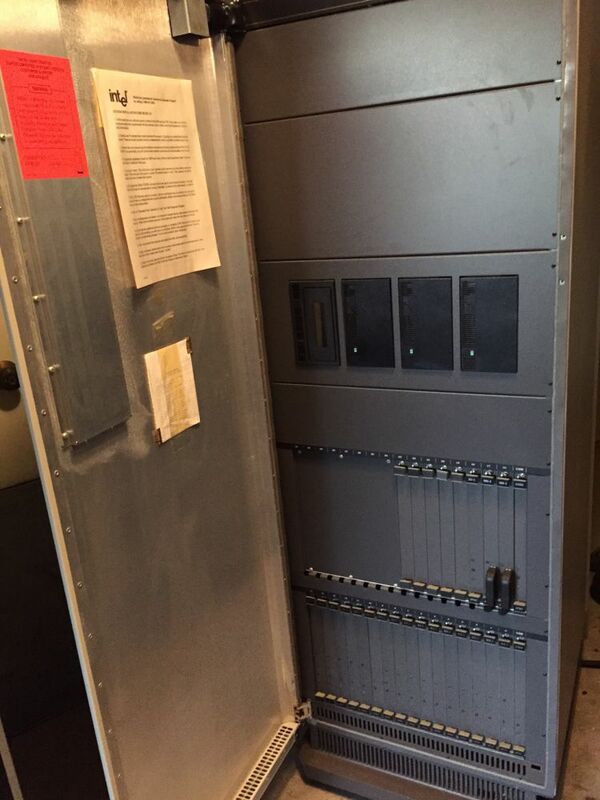 I have no front picture of the I/O cabinet with the doors open yet, but from the side, a 9-track StorageTek reel-to-reel tapedrive can be seen. 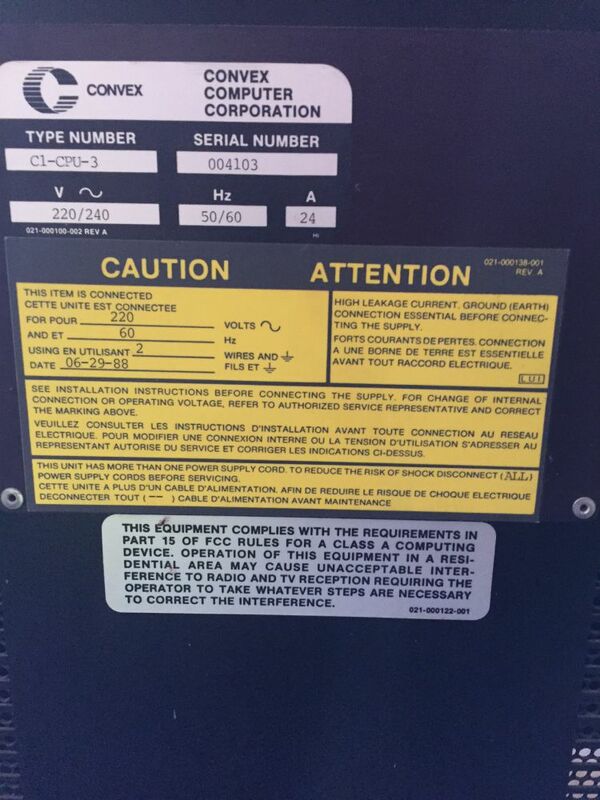 At the left edge is a black rectangular box that I assume is the RS-232 port interface to a 16-port Systech MTI-1600 or MTI-1650 controller. There should have been one or two SMD hard disks in this cabinet (the main hard drive for the system), but these are sadly missing. The third system in the lot is an Ardent Titan. A Titan can have up to 4 cpu boards in stalled. Each board contains a MIPS R2000 microprocessor for scalar operations, as well as a custom designed vector processor with divide, a pipelined multiplier, and a pipelined adder/subtracter as independent arithmetic function units. Data is streamed from shared memory directly to the vector registers via 1 store and 2 load pipes. The vector registers are 8192 words long and can be configured in any mode between 8192 registers of one word each to 32 registers each of 256 words. Each word is 64-bits long. The clock cycle time is 62.5 nsec, and each vector processor is rated at 16 Mflops, giving a maximum potential of 64 Mflops. A major feature of the Titan is its integrated graphics support. Up to two graphics boards (base graphics + extended graphics) can be attached to the bus and are powerful processors in their own right. All pixel manipulation is done on the graphics boards minimizing traffic between them and the vector processors, which can be employed on related or independent computation to the graphics processing. Graphics is supported by PHIGS+ and CGI as well as Ardent's own software package called Dore (Dynamic Object Rendering Environment), which handles image representations from wire-frame through flat and smooth-shading to global ray tracing. From the pictures, it looks like my Titan has a single CPU, 2 memory boards (64MB total), extended (2-board) graphics adapter, and the standard I/O card (2x SCSI, keyboard, mouse, audio, ethernet, 4 x serial, parallel). The single CPU is in the slot reserved for the second CPU, and the slot for the first CPU is empty, so perhaps this system started with two CPUs, and had one of its CPUs removed. 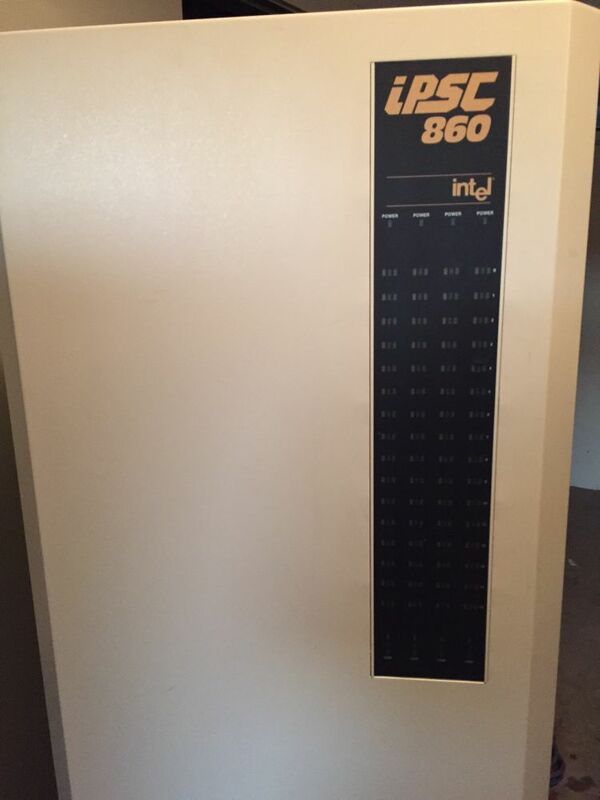 The Intel iPSC/860 is a parallel computer, using nodes using 40 MHz Intel 80860 CPU's in a hypercube configuration. From the pictures, I think this is the smallest configuration, with 16 node boards. The largest systems contain 128 CPU's. There should have been a 386-based workstation called the SRM (System Resource Manager) with this system, but that appears to be missing.